For the third consecutive month U.S. commercial P&C rates declined by an average of 1% during August, as insurers look to put a stop to any further rate reductions, according to market analysis from MarketScout and Keefe, Bruyette & Woods (KBW). The trend of U.S. commercial P&C rate declines has continued, with rate movements in August, on average, declining by 1%, the same witnessed in both June and July and a continued improvement on the 2% decline witnessed in May. “While the month to month composite rate is stable there is clear movement in commercial auto and transportation accounts with each showing a year over year rate increase of plus 3 percent. Insurers have decided it is time for commercial auto and transportation accounts to start paying up,” said Richard Kerr, the Chief Executive Officer (CEO) of MarketScout. Kerr has noted in previous months that insurers appear to be tiring of falling rates, and a continuation of the 1% average decline suggests that industry players are eager to put an end to any further rate reductions. The insurance and reinsurance marketplace has been under pressure for many months now, but it’s promising to see that insurers appear to be disciplined in their strategies in an effort to mitigate further rate declines and ultimately increase pressures. 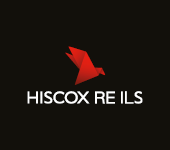 Property rates have of course been the most pressure, with the overspill of reinsurance and ILS capital impacting the commercial property market and now even the homeowners insurance market. Both insurance and reinsurance firms will be looking carefully at losses in the U.S. this year to see if any rate increases can be installed, particularly after Hermine. Whether this could also influence commercial property insurance lines is yet to be seen, as the pressure from reinsurance capital would likely offset this. 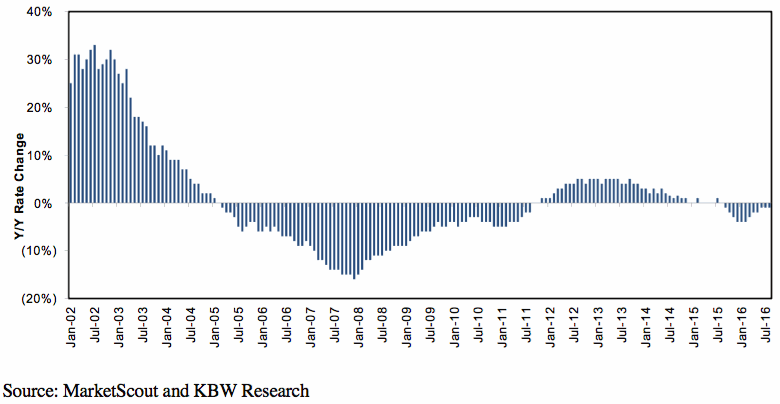 Overall, rate movements in the sector have been negative since September 2015 explains KBW, and highlighted by the below graph. “Rate decreases still trail even benign loss cost inflation, so accident-year underwriting margins will almost certainly contract, depending on individual companies’ loss reserving conservatism,” said KBW. MarketScout’s U.S. commercial P&C market barometer also breaks down average rate movements by account size, which reveals that in August small (up to $25,000), medium ($25,001 – $250,000), and large ($250,001 – $1 million) sized accounts showed no change when compared to July, declining by an average of 1%, 1%, and 2%, respectively. The only account size to report a change during the month was jumbo (over $1 million) sized accounts, which MarketScout reveals adjusted from -3% in July to -2% in August. Interestingly, MarketScout’s monthly U.S. commercial P&C market barometer also offers some insight into average rate movements by coverage class. According to MarketScout’s analysis business interruption, BOP, general liability, professional liability, D&O liability, fiduciary, and surety remained flat in August. Commercial property, inland marine, umbrella/excess and workers’ compensation declined by an average of 1% in the month, while EPLI and crime increased by 1% in August. As noted earlier by Kerr and KBW, commercial auto lines showed some promise in the month, increasing by an average of 3%, the most substantial increase of any coverage class during the month. It’s certainly positive to see that while the pressures shaping the insurance and reinsurance marketplace remain, industry players appear to be disciplined in their efforts to navigate the testing market. With the softening landscape showing little sign of stopping it will be interesting to see how insurers in the P&C industry attempt to mitigate mounting pressures, and put an end to further rate reductions. – Commercial P&C rates down 3.9% in Q2, buyers market remains: CIAB. – Insurers push for end to commercial P&C rate decline, 1% down in July. – Commercial rate decline slows in June, insurers “tired of cutting rates”.